Nevada residents must register their vehicles with the Department of Motor Vehicles. Application must be made in person and require vehicle titling and proof of insurance. Specialty plates representing state organizations, occupations, and charities are available. All vehicles in the state of Nebraska require a license plate issued by the Department of Motor Vehicles (DMV). These license plates must be attached to both the front and the rear of a vehicle with the exception of motorcycles and trailers. The standard license plate design has a sunset background with dark blue lettering. Specialty plates are available for additional fees and some have eligibility criteria. Disability plates and placards are also available for people with disabilities which permits them to park in designated disability parking spaces through the state. Most plates can be personalized for a fixed rate and must following the state’s guidelines before being approved for the road. You can find a variety of specialty license plates available when registering your vehicle with the DMV. Fees vary by plate, and you may have to meet eligibility criteria in order to be issued these license plates for your vehicle. You can apply for specialty license plates either in person, online, or by mail. If you already have license plates for your vehicle, you may be required to surrender your old plates. If you are applying for disability license plates in Nevada, you will be required to submit the necessary medical documents to be eligible. Placards must be hung from the rear view mirror and must be visible at all times. Disability placards and license plates enable people with disability to park in designated parking spaces throughout the community. Most license plates issued by the Nebraska DMV can be personalized with a custom plate number. You should look up available plate numbers online before applying for them. You will also be required to pay for the standard registration fees and taxes. In the event that your Nevada license plates have been stolen, you should contact the police and file a report. Missing or stolen plates can be replaced directly from the DMV office. Note: You cannot apply for the same plate number if they were stolen. You will be required to register new license plates for your vehicles. If your license plates were damaged, you can apply for replacements with the DMV. You will be required to surrender any remaining plates in order to receive your new ones. You can surrender your plates either in person or by mailing them to the DMV. You can transfer your license plates when you register a new vehicle with the DMV. You must prove you are the owner of the vehicle in order to transfer the plates over. If you are the owner of a classic car with antique plates, you cannot transfer your license plates. Those license plates will remain with the vehicle when sold or donated. You should receive a notification from the DMV that your license plates are soon to expire. Whether you receive a notification or not, you are required to renew your vehicle before the expiration date on the rear plates. You can renew your vehicle either online, in person, or by mail. After you have successfully renewed your vehicle, you will receive a new set of decals which can be placed over the old ones. 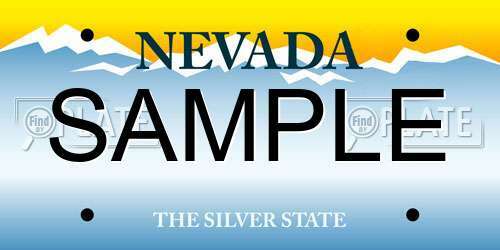 Contact your local DMV center for more information about fees and taxes for license plates in Nevada. If you want to look up license plate numbers in Nevada you can use FindByPlate to search by state. All you have to do is submit the license plate number with the state and you’ll obtain results for that plates history and availability.